Global electronic health records market expected to generate revenue of around USD 4019.00 million by end of 2026, growing at a CAGR of around 5.2% between 2018 and 2026. Electronic health records (EHRs) are nothing but electronic medical records; these are a digital version of the paper charts that were previously available in the healthcare provider’s office. The report covers forecast and analysis for the electronic health records market on a global and regional level. The study provides historic data for 2016 and 2017 along with a forecast from 2018 to 2026 based on revenue (USD Million). The study includes drivers and restraints for the electronic health records market along with the impact they have on the demand over the forecast period. Additionally, the report includes the study of opportunities available in the electronic health records market on a global level. In order to give the users of this report a comprehensive view of the electronic health records market, we have included competitive landscape and analysis of Porter's Five Forces model for the market. The study encompasses a market attractiveness analysis, wherein product segment, type segment, and end user segments are benchmarked based on their market size, growth rate, and general attractiveness. 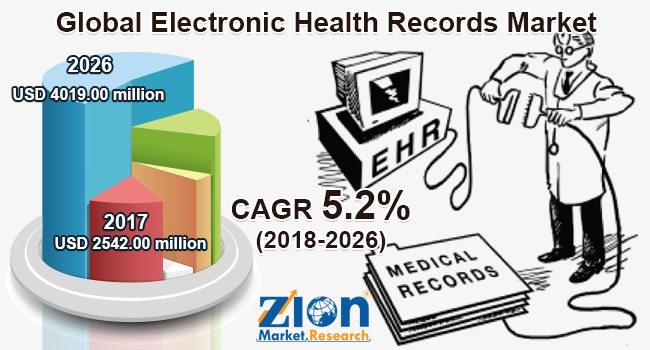 The study provides a decisive view of the electronic health records market by segmenting the market based on product, type, end-users, and regions. All the segments have been analyzed based on present and future trends and the market is estimated from 2018 to 2026. Based on the product, the market is segmented into web-based electronic health records and client server-based electronic health records. On the basis of type, the market is classified as ambulatory EHR, acute EHR, and post-acute EHR. Based on end-user the market is segmented into hospitals, physicians, pharmacies and ambulatory centers. The regional segmentation includes the current and forecast demand for North America, Europe, Asia Pacific, Latin America and the Middle East & Africa with its further bifurcation into major countries including the U.S., U.K., Germany, France, Italy, Spain, China, Japan, India, and Brazil. This segmentation includes demand for electronic health records market based on individual product, type, and end-user in all the regions and countries. The report also includes detailed profiles of end players such as Allscripts, Cerner, MEDITECH, McKesson Corporation, NextGen Healthcare, and Epic Systems Corporation, which are some of the well-founded companies in the electronic health records market. In addition, some of the upcoming companies in the electronic health records market include Healthcare Management Systems, eClinicalWorks, CureMD Healthcare, and Healthland, among others.